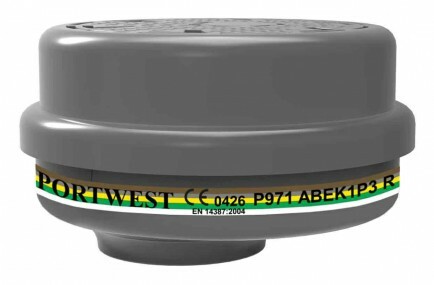 A Portwest replacement bayonet filter providing ABEK1P3R protection. The Portwest P971 bayonet Filter offers ABEK1P3R protection against organic gases and vapours with a boiling point of 65 Deg C and above. Inorganic gases and vapours and sulphur dioxide and other acidic gases and vapours as well as against ammonia and its organic ammonia derivatives vapours and gases and dust/ particles. EN143:2000 / EN14387:2004.